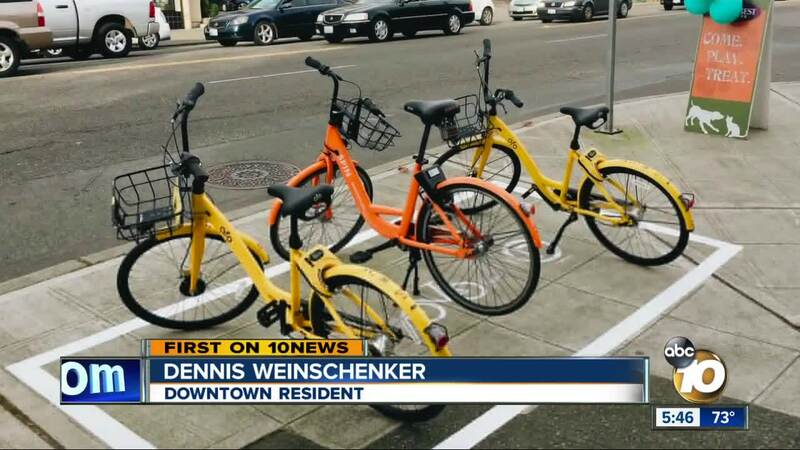 SAN DIEGO (KGTV) - A new proposal could bring order to the dockless chaos on San Diego streets. If you've taken a walk downtown, you've probably seen them: dockless bikes and scooters where they shouldn't be located. Some block sidewalks while others block entrances to businesses. "We can trip over them. They block access for the disabled and block businesses we want to go in and out of. It's frustrating and not safe," said Vicky Mann, who lives in a condo on Union Street. Enter a possible solution: designated parking spots for dockless bikes and scooters. Seattle put them in as part of a pilot program earlier this year and Santa Monica just did the same. "I think it would make it clear to folks where to park...keeps sidewalks cleaner, safer and more accessible," said Mann. Mann isn't in favor of designated spots on the sidewalk because it sends the message it's okay to ride on the sidewalk. So who would pay for this? Bry says bike and scooter companies have expressed willingness to contribute money, which could pay for things like enforcement, public awareness campaigns and other programs. The entire slate of new rules could land in the council committee for a vote this fall. "We have to be cognizant of how these bikes and scooters impact our streets and sidewalks, especially when they are carelessly left in areas with high pedestrian and vehicle traffic," said Councilmember Bry.